Courtesy photo Raffle tickets are available for $2 at Galion Public Library for this large Reindeer Ranch gingerbread house. 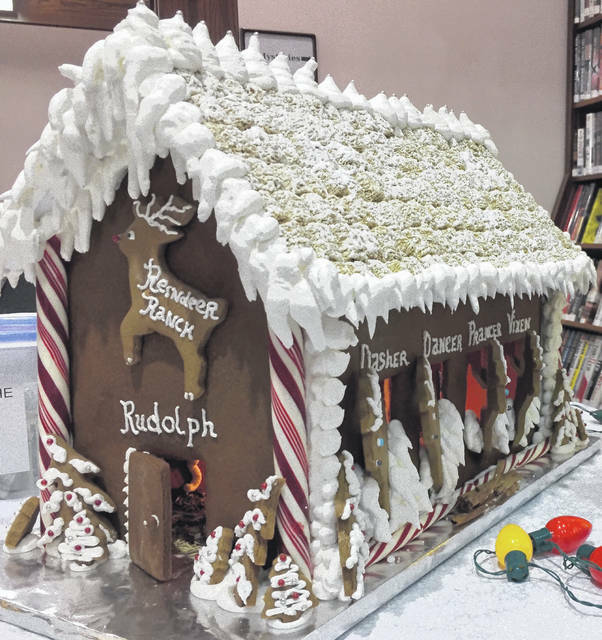 GALION — Raffle tickets are still available at Galion Public Library for a 12-x 24-inch original Reindeer Ranch made out of gingerbread. This Reindeer Ranch features all of Santa’s eight reindeer, including the charming Rudolph. A small, lighted fixture inside ignites the aromatic mixture of rosemary and whole cloves which surrounds this structure. The Reindeer Ranch. which is sponsored by the Friends of the Library, can be seen at Galion Public Library where raffle tickets can be purchased for $2 each. The drawing for the Reindeer Ranch will be Dec. 21. There will be a special gift for the winner of this holiday display, as Vossers will be donating a box full of freshly baked gingerbread cookies from Bill’s Bakery. Stop in and visit the library and but some raffle tickets during this holiday season. https://www.galioninquirer.com/wp-content/uploads/sites/38/2017/12/web1_Reindeer-Ranch-Photo2017121421429385.jpgCourtesy photo Raffle tickets are available for $2 at Galion Public Library for this large Reindeer Ranch gingerbread house.